MTV has done the totally thinkable and added the worst category they possibly could have added to the upcoming Video Music Awards: Best Lyric Video. Right, because what lyric videos needed was more validation that they're a thing that's different from a regular music video. Mashable reports that the first nominees in this prestigious category are the videos for Katy Perry's "Birthday" by Katy Perry, "Really Don't Care" by Demi Lovato, "Mmm Yeah" by Austin Mahone featuring Pitbull, "Problem" by Ariana Grande featuring Iggy Azalea and "Don't Stop" by 5 Seconds of Summer. Nice job guys, throwing 5SOS in there to make me impressed but IT WON'T WORK. Congrats, congrats, very nice all. But these are not lyric videos. These are music videos and should be regarded as such. MTV just added a category they should have called Video of the Year II Oh Wait These Aren't That Good but instead they lied and called it something else. In a way, this is a step back and they're returning to the early years of the show, when they doled out awards for things like the Best Concept Video. 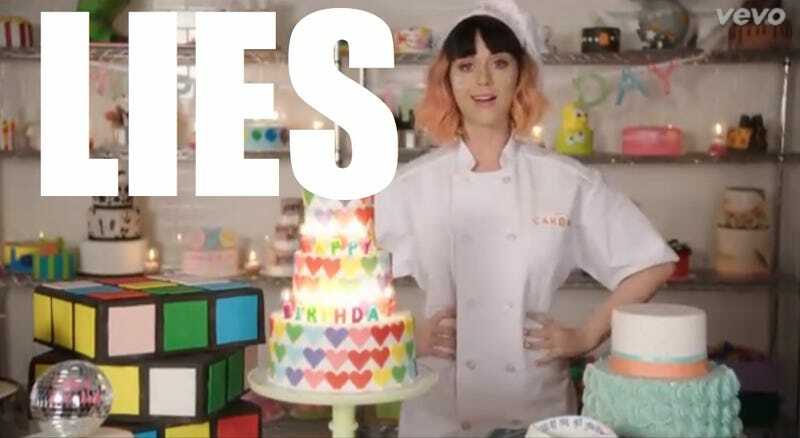 Sure, maybe those aren't Katy Perry's hands moving around all those delectable cakes, but that's definitely her at the end ergo, music video. Do you see Ariana Grande there, behind all those words? See Iggy? Yup! They're right there, singing. Demi Lovato, "Really Don't Care"
Oh who's that? Demi Lovato. Austin Mahone feat. Pitbull, "Mmm Yeah"
5 Seconds of Summer, "Don't Stop"
Unsurprisingly, 5SOS's video is the only one that remains a true lyric video, with nothing but cartoon sketches of the band. Point, MTV. The only point. If you would like to vote for your favorite "Lyric Video" you may do so here, you traitorous fool. Image via Katy Perry's "lyric video" for "Birthday"